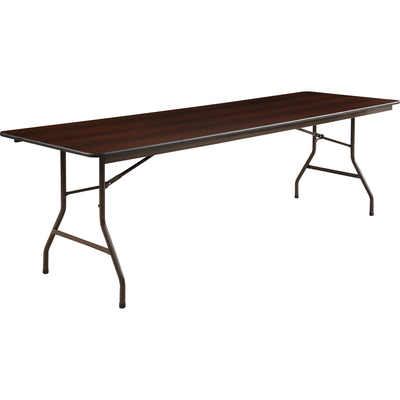 Economy, 96" Wide Folding Table Features A 5/8" Thick, Wear-Resistant, Melamine Top With A Pvc T-Molded Edge. Melamine-Sealed Underside Prevents Moisture Absorption. Steel Skirt Support With Plastic Corners Protects Surface When Stacking. Capacity Is 500 Lb. Evenly Distributed And 300 Lb. For Concentrated Loading. Folding Table Is Supported By 1" Diameter Steel Legs With Protective Foot Caps..
Economy, 96" Wide Folding Table Features A 5/8" Thick, Wear-Resistant, Melamine Top With A Pvc T-Molded Edge. Melamine-Sealed Underside Prevents Moisture Absorption. Steel Skirt Support With Plastic Corners Protects Surface When Stacking. Capacity Is 500 Lb. Evenly Distributed And 300 Lb. For Concentrated Loading. Folding Table Is Supported By 1" Diameter Steel Legs With Protective Foot Caps.